The first day of daylight savings was a windy, rainy one, but it’s 6:45pm, the clouds have broken, the sun is still out. We can’t complain. Especially since we spent the day cooking the most amazing meal: pork ribs slow braised in Coca-Cola, soy sauce and apple cider vinegar; collard greens with bacon and sausage and a new member of our immediate family, bourbon bacon jam. Hello, dear. Sit down, you’re just in time for dinner. I first heard the ingenious words “bacon” and “jam” together when season 6 “Top Chef” contestant Kevin Gillespie made it during a quickfire. Since that brilliant moment, I knew I’d make it at some point. With tonight’s menu, the time was ripe. I followed the recipe on the blog evilshennanigans.com with minimal deviation. I started by barely crisping bacon in a cast-iron skillet. 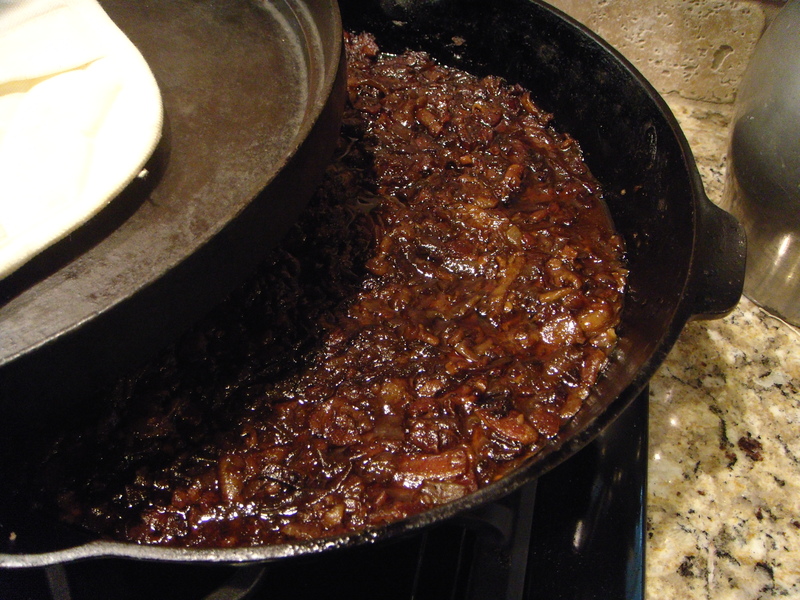 Reserving a bit of bacon fat, I added one very large sweet onion (sliced) and bit of brown sugar, and caramelized until the onions took on a deep golden brown color. In went the spices: cloves, nutmeg, cinnamon, allspice, chipotle powder and sweet paprika. I added a bit more bourbon than the recipe called for, and caramelized the onions for at least ten minutes after the spices went in — that’s it. After a good two hours on the stove and a quick spin in the food processor, the sticky sweet, salty, spicy jam was ready. The result was one of the most amazing things I’ve ever tasted. Our favorite bite so far: a slice of apple, a piece of blue cheese and a dollop of the jam. Frying the bacon, just until it starts to crisp. Sliced sweet onions caramelized in bacon fat. Collard greens with red onions and bacon. He’s very handsome. And, we think he’s gifted.